Magic Leap One is not only about fun and Game of Thrones. While Magic Leap has always said its disruptive spatial computing and mixed-reality technologies would find all kinds of use cases, including in healthcare and social impact, it’s the entertainment uses that so far get the buzz. Not that there’s anything wrong with that, but when Magic Leap recently tweeted this video about its work with Dan Marino Foundation for autism, I wanted to know more. The unemployment rate for people on the autism spectrum hovers just under 90% — way too high. While many people with autism have the necessary capabilities to succeed in jobs, they find the in-person job interview stress provoking and socially and verbally challenging. Microsoft and other companies have found that rethinking the job interview process can open the door to jobs for these young people. Now a tool by Magic Leap, in a recent partnership with The Dan Marino Foundation and the University of Southern California’s Institute for Creative Technologies, is helping. Their tool, The Virtual Interactive Training Agent (ViTA) for Magic Leap One, is a virtual simulation job interview practice system that builds competence and reduces anxiety. It allows users to repetitively practice job interviewing in a safe simulated environment, across a range of challenge levels and allows for customizable training geared to the needs of the user. The Dan Marino Foundation is a premier South Florida non-profit founded by Dan and Claire Marino shortly after their son, Michael’s, autism diagnosis in 1992. The ViTA tool is just one of the foundation’s innovative programs, some using virtual and mixed reality technologies, helping young adults with autism and other developmental disabilities gain independence and employment. The foundation’s desktop version of ViTA is already available. 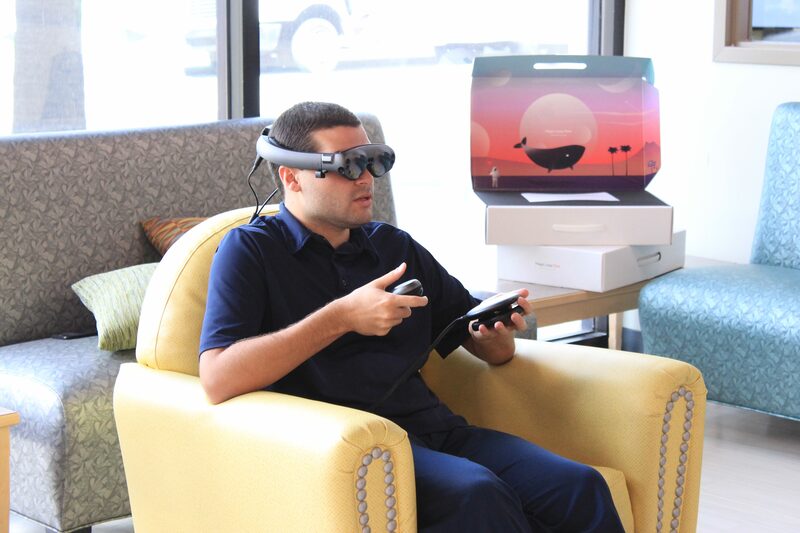 ViTA Magic Leap is currently in development; Dan Marino Foundation students use ViTA Magic Leap 1.0 as a complement to the 10-month career training curriculum. Its ongoing partnership with Magic Leap will allow for further development of ViTA avatars. Stay tuned. And for those of you who still want to catch Magic Leap One’s Game of Thrones experience, we get that. It’s at limited sites now, but it’s coming to more AT&T stores in 2019. Photo provided by the Dan Marino Foundation. Follow @ndahlberg on Twitter and email ndahlbergbiz@gmail.com.